– been active in the domain investment community. – worked for a registry that went from a few domains per day to several million. – helped prepare/file 60 new gTLD applications including .xyz, .club, .blog, and .law*. – worked for a registrar focused on ccTLDs and the digital brand management business. These experiences have given me many perspectives and a view of the industry from all angles. 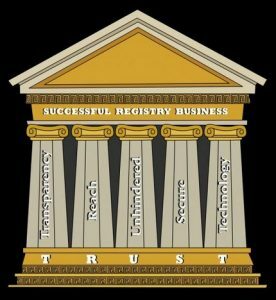 So what makes a registry successful? It starts by recognizing a registry has two types of clients. The first are partner types, your sales channel, like registrars and resellers. The second are end user types like all of the various kinds of domain name buyers. It’s an ecosystem that includes domain investors, enterprise and brand management types, small and medium sized businesses, entrepreneurs and startups, non-profits, and personal users or hobbyists interested in sharing ideas online. Merriam Webster describes a registry as an “official record book”. In today’s world that means a database. To be official, the record must be open and trusted. By their very nature, domain name registries need to be open. They need to operate in a manner that allows registrars, resellers, and end users to understand what is going on in a domain zone and what the registry offers. Your sales channel and the public both need to know what is registered and what is available. Your registry WHOIS record is a tool that can be used to do business (check which domain names are available and which are taken) and to keep the Internet running well (find out who is behind fraud, spam, phishing, and other online malevolence). The Internet has made communication so easy. You can’t hide information easily anyway, so why force your clients to guess about what you are doing? Eventually everything gets out. Operating in an open and transparent fashion makes a huge difference. Operating transparently takes preparation. I run across registries from time to time who have not decided fully on their pricing and premium domain name structures. This harms their chances for success and should be worked out fully before a registry opens for business. Rules of engagement should be clear, concise, and documented. The idea is to play fair. Rules should include the ways that you offer your domains, who offers them, a complete domain name life-cycle that goes from registration through deletion with time frames, and how disputes are dealt with at various stages in time. There’s more than that; plenty of examples exist for reference. Your sales channel wants to know that there is an equal playing field, that they have an equal chance to succeed in the market. Establishing clear rules from the start will go far in helping them to feel that way. What channels will you use to sell your domains? Will you have a direct channel, and if so will your prices undercut your partners? There is nothing wrong with having a direct channel but competing with your partners based on price will likely sow distrust among partners. This is one of the oldest rules in a channel playbook but is sometimes ignored. How will you deal with trademarks? Will you work with dispute mechanisms such as the World Intellectual Property Organization (WIPO) or the ADR Forum? How will you handle abuse, fraud, spam, and phishing when it is found and reported? These questions need to be addressed in your rules; your Terms and Conditions. This stuff will come up and the reputation of your zone file will depend on how you handle this. DomainTools recently put out a white paper and reported one new gTLD as “Pure Evil and the #1 Hotspot of Badness” in terms of spam, phishing, botnets, and malware. That can’t be valuable to that registry and will surely hurt their reputation for some time to come. There are a lot of ways to reach markets, but a full cadre of accredited registrars is vital. Part of success is having a strong and supportive channel, most importantly the registrar channel. Many ccTLDs rely only on a direct channel (their own website) or a group of local registrars and ISPs within their countries. They lose opportunity because there is often much more demand from the larger out-of-country markets. Experience shows over and over, that if you have more registrars you will sell more. This is cash flow that can be used to expand or (if you are a non-profit or government operator), to subsidize other valuable and important programs. Some registries charge a smaller fee to in-country registrants and a larger amount to registrars that are out of the country; it’s a good way to be supportive of your own citizens while enjoying the financial benefit of larger markets. Don’t underestimate the demand for your string. Many registries, gTLDs and ccTLDs have succeeded beyond their dreams through proper execution and sometimes through luck. Some of these were thought to be hopeless before moving forward. Think .XYZ; many said they would fail, “Who would want to register .XYZ? What does it mean?” – They proved their critics wrong. Who would have thought that .ws would do as well as they have? Who would have expected .bz or .io to become as big as they have? Your ccTLD is no different. You just have to put it out there and look for where the growth will come and take advantage of every opportunity that presents itself. Another advantage of reach is that buyers, whether in your country or not, want to do business with large and stable registries. I’ve spoken to many ccTLD operators who wonder why people from within their own countries buy .com instead of their ccTLD. The reason is often that those registrants want to go with the bigger guy; the one who they can trust to be around forever. It’s just human nature. Getting bigger sooner is a good way to ensure continued and long-lasting success for your ccTLD. There is a domain name market ecosystem that is quite beautiful to watch if you allow it to happen. A successful registry will not be a hindrance to the market. If you are a new registry, domain investors (“domainers”) along with large corporations that own trademarks are likely to be your first supporters. Domain investors are commonly lumped in with cyber-squatters and this they are not. This is a common large mistake. There is a large, important, and legitimate industry sector represented by domainers. By investing in your domain names, these types become stakeholders with an interest in seeing your domain registry succeed. I dare say that domain investors along with enterprise and brand-conscious end users are a key component in a fragile market ecosystem for new registries. They are the ones who are intensely interested in your new products and initiatives and who will support you when you need business the most. Small businesses and other kinds of end users simply are not aware nor interested in domain names regardless of whether they should be. At times in the growth of your business when you need buyers the most, only those who are intimately acquainted with the industry have an interest. These are important clients (domainers and corporate). Another thing to remember is that domains are subscription products. Every day that goes by without a domain name registered is lost income. Years can go by very quickly and every day that a potential name is unregistered equals lost time and money that will most likely never be recovered. “Saving” a domain for a higher price later doesn’t usually bring added value to a registry. Finally, even if you try to sell your domain(s) for a premium price, it’s important to consider the market’s perception of your actions. If you think your clients become happy when they hear you sold a premium domain name for high dollars, you are simply mistaken. In fact, their perception is generally one that causes mistrust and suspicion of the registry. The market chatter about this is not positive nor relatable to them because the premium revenue goes directly to the registry. It may be helpful and necessary in the short run. I just don’t think it helps long term. It’s much different than when the market hears about an end user selling one of your domain names for a significant price. That is relatable to them. It is encouraging to them. It causes them to want to invest in your TLD. The news of a high-priced sale in the aftermarket is very valuable to a registry, likely the cause of significant increases in registrations for some time afterwards. People begin to feel like “Maybe this can happen to me!” Your domain string becomes valuable in the market. This is healthy long term revenue and growth for your TLD. DNSSEC – Many registries now sign their zone file, thereby offering registrants a more secure way to build their online presence. Cyber Crime Analytics – There are many tools today that can help you fight cyber crime in your TLD. Security Tools, Firewalls, and DNS Security Expertise – You need to use the best tools available and qualified security personnel to make sure your systems are safe. Server Security – Servers must be protected on all levels. Cooperation and Coordination with Authorities – Authorities world-wide are anxious to work with registries to fight spam, phishing, and all kinds of online fraud. Continuing Education for Staff – an educated workforce is as important as any tools. Security is a deep topic and there are many more issues that need discussion here. But those details are beyond the scope of this article. Suffice it to say that security is of paramount importance and very difficult to achieve on your own unless you are a technical and security expert. In today’s security environment, scaling while securing your registry may require outsourcing. Only the largest registry service providers can scale at the rates necessary to keep up with the crooks online today. Stability is a result of strong security but I add it here because the word transcends technology and expertise. Registrants need to know that they can depend on you as their registry. Someone once compared ICANN to a glacier, they pointed out that although a glacier is unstoppable, at least you have time to get out of its way. I appreciated that. Everything we do as a registry says something about our stability. If we are changing policies and pricing as fast as a jackrabbit changes direction, that says something about our character and doesn’t go unnoticed. Your clients will do better if you make decisions deliberately and thoughtfully. The vast majority of domain registrants expect domain names to be registered instantly. The domain industry is highly automated and highly transactional. There are a few registries with nexus rules or qualifications for registration but it is always important to be timely in our industry. We’re in an unusual business where products are actually not created until a customer is ready to buy. If you think about it, that is very unusual. Customers check domain names that they are not sure even exist (because they may already be taken). When they see that the domain name they want is available, they become very anxious to buy it. Patience is naturally very thin. Your technology for qualifying registrants and helping them secure and manage their domains needs to be quick and dependable. Although you may see yourself as the only place they can buy your particular domain name, you are competing in a world where other registries stand very close and competitive. If someone can’t get their .law domain for example, there is a .lawyer and .attorney domain name as a quick backup (this is just an example and I’m a fan of .law – they are a unique and generally efficient registry). The point I make here is that with over 600 generic Top Level Domains (gTLDs), and 250 or so country-code TLDs, there is a lot of competition today. Every registry needs to consider that and ensure that their technology makes the grade (allows registrars and registrants to secure and manage domains quickly and dependably). Many / most of these functions need APIs and EPP handles that registrars will use to automate things. It is no small task. I know this part is jargon to some readers here but this article is intended for a Registry audience. These are critical functions that registrars and registrants (your clients and end users) need to do almost every day if you are to succeed. This is another area where automation is important. Many of these functions fall upon Registrars but they will depend on you to help them make things happen. Here again, a registrar needs to be prepared. Outsourcing can be helpful or critical to the successful growth of your registry. Should You Use a Registry Services Provider (RSP)? After eighteen years of observation and study, one thing I know for sure about the domain name industry is that trust is more important than price as a factor for buying (or investing) in a domain name. Registrars and registrants are looking for a foundation to build their businesses on. A domain name is that foundation. 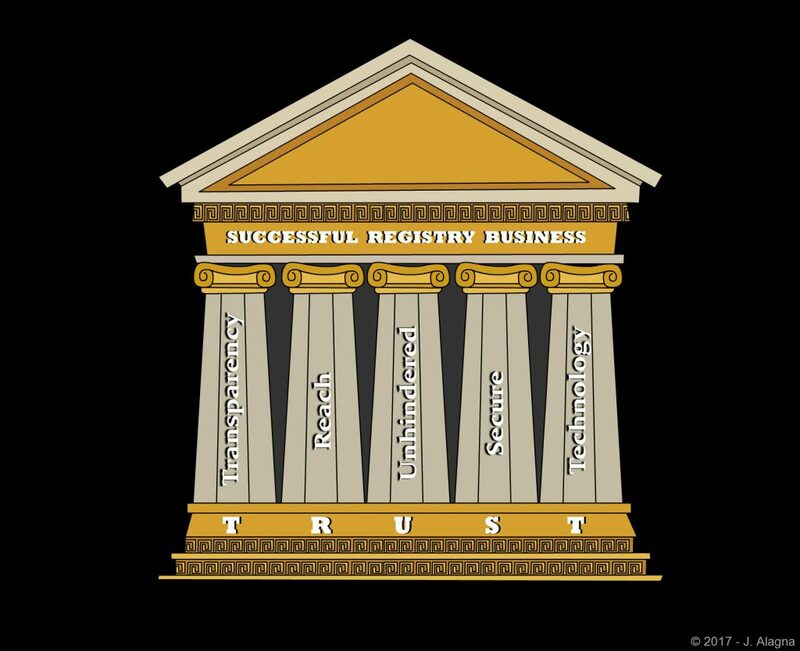 They need to know that you can be trusted and each of the five pillars matter. If they lose confidence in you, they will choose a different foundation and there is no shortage of choice today. An RSP can help you fast-track each of these initiatives so you can get them in place much more quickly and, since time is always of the essence, it may be the best way to get it done. An RSP can also give you near instant access to a world-wide channel of registrars. As a final note, these pillars are a summary. I recognize that there are many other factors involved in the success of a registry. My goal was to put together some of the main points and to emphasize the importance of that one, often overlooked factor, trust. This entry was posted in ccTLDs, Country Code People and tagged cctld people, cctlds, Country Code People. Bookmark the permalink.